Liam Walsh on World Title Shot: This is perfect timing for me! 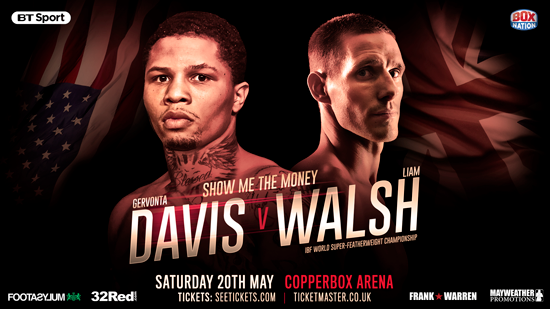 Undefeated Cromer hero Liam Walsh believes his long-awaited World Title shot against IBF Champion Gervonta Davis has come at the perfect time. Floyd Mayweather protege Davis makes the first defence of his World Title against mandatory challenger Walsh at London’s Copper Box Arena on Saturday 20th May, live on BT Sport and BoxNation. Walsh’s date with destiny has been a long time in the making. A car crash forced the Graham Everett-trained slickster to withdraw from his WBO Lightweight World Title fight against Ricky Burns back in 2012. But now the 21-0 Super-Featherweight is ready to seize his opportunity and dethrone the man many are calling boxing’s next superstar. “I’m now fighting ‘the man’ in World boxing, or so they say,” said Walsh. “It has been a hard journey to get myself back in place for another World Title shot. There was times when I thought to myself ‘is it ever going to happen?’. “That’s what makes Champions – that defiance and will to keep on coming back from set back after set back and not be denied. That’s why I am here now. I have the desire and the will to push through and reach the top.